Standing in the lobby of the High Museum of Art, it is hard not to feel awed by the floor-to-ceiling windows, the crisp air and the streams of sunlight flooding into the large halls. Today, standing at the podium to give an introduction on his work, is Vik Muniz, a man who at first might not strike audiences as an artist. In his mostly black ensemble, he blends in with the eager media sitting attentively with their large cameras and notebooks; however, as he begins to speak, in the way he holds himself, in the excitement lighting his eyes, there lies the evidence of artistic gears grinding in his mind. Muniz’s works attempt to mesh the everyday with the extraordinary. His technique is to create images out of unconventional materials. He then takes high-resolution photographs of these creations, enlarges them and prints them for display in the collection. Walking through the display, the walls are covered in huge portraits assembled out of children’s toys such as jacks, marbles and rubber animal figurines. A recurring theme of Muniz’s collections is that up close, it is difficult to discern what the overall picture is supposed to be, but easy to notice the rich details in what the picture is composed of, such as how the peanut butter was slathered, or how the chocolate syrup oozed. Taking several steps back, suddenly the picture starts coming together as the composite parts fade out of focus. For the students searching for something more science related, Muniz’s “Colonies” series was produced in collaboration with Massachusetts Institute of Technology scientists. Together, they grew bacteria, liver and cancer cells into intricate patterns. 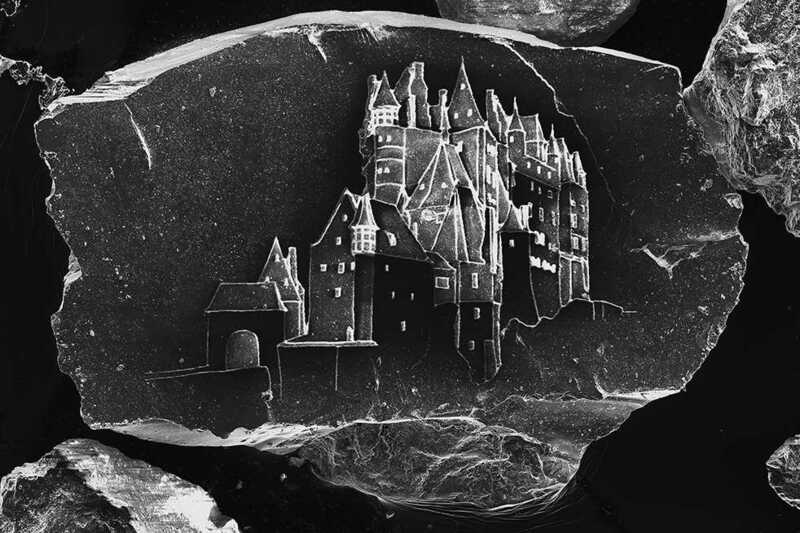 In addition, Muniz also collaborated with Marcelo Cuehlo, a computational artist and designer, to etch castles on grains of sand using a Focus Ion Beam. Muniz’s collections are captivating in the way that they play with their perspectives, from the microscopic level of the cells to aerial shots of art created in dirt by large excavators. Just next door to Muniz’s exhibit is “Basquiat: The Unknown Notebooks,” an exhibition of rarely seen notebooks by Jean-Michel Basquiat, an artist who rose from his fame in the street art community to a legendary status in the art world and in pop culture. This exhibition area is filled with a playful use of color, numerous notebook pages of clever musings, and Basquiat’s homage to his favorite works. Of course, they are produced with his signature style: thick, capital letters and a gold crown that represents not only his hair style, but the qualities he saw in himself, qualities of Martin Luther King Jr. and his work on integrating America and finally his pride for his culture and heritage. Each of his pieces embody a free, rebellious spirit, contorting themselves to defy the old conventions of art. Though Basquiat’s life came to an end at the young age of 27, the reach of his pieces have permeated pop culture through films, fashion and hip-hop music. Each piece screams social commentary — they challenge social hierarchies, rules, religion and racial discrimination. The High Museum is located just five minutes from campus, across from the MARTA Arts Center Station. Vik Muniz’s exhibit will be open until Aug. 21, and “Basquiat: The Unknown Notebooks” will be open until May 29. The High Museum always has student discounts with a valid ID, and April is college month, which means five-dollar admission! Come stop by with friends or a significant other and become intrigued by the exhilarating works of Vik Muniz and Jean-Michel Basquiat.